Isn't this an amazing creature? 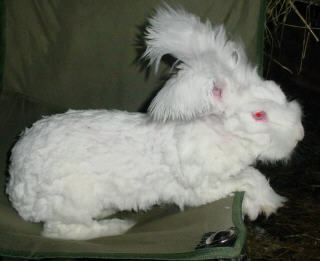 Misty is a gorgeous purebred German Angora doe, from a wonderful line that includes rabbits from Spinning Bunny and ISeeSpots, along with totally new genetics from Samson lines on the father's side. She hasn't always been this wonderful, however. Misty was born in my old bunny barn, a converted chicken house that had long been vacant. Her mother, Living Water Farms Angel, is a sweet, gentle rabbit from gentle, purebred lines that I am familiar with. Angel is also a wonderful fiber producer and has a terrific, non-matting coat. This was my first litter with the father, a nice fellow that isn't an astonishing wool producer but has a good temperament. There were six bunnies in the litter and Angel raised them all with ease. Misty was my pick and the rest of the bunnies went fast. Then the roof fell in. In the barn, of course. A poorly constructed leaking section of the roof finally collapsed and I had to shift the rabbits around to keep them dry. For a little while the rabbits lived in a very dark area in the old shed while we converted a section of the old barn on the farm into a bunny house. I moved the rabbits late one night after putting the floor down because I couldn't stand for them to be there one more minute. The other rabbits seemed to love the new, airy barn with all the light coming in. Not Misty. 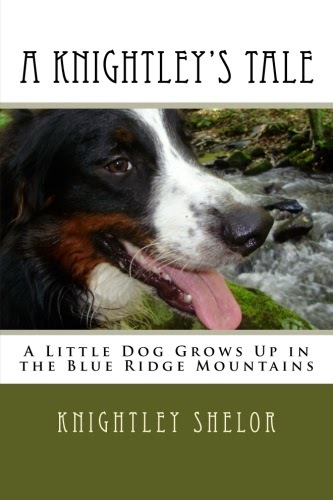 She never stopped eating, but her personality changed and she became very timid and nervous. She only weighed 5 pounds when she was a year and a half old. Of course I didn't try to breed her, worried about her condition and not wanting to pass on bad traits. 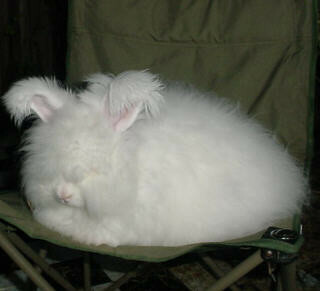 When I checked with buyers of her siblings, however, they reported fine healthy rabbits that they were enjoying. One sister had successfully raised a litter of seven healthy bunnies! As you can see from the picture, Misty has come out of her shell in the past four months and has gained up to seven pounds. She is as cheerful and friendly as any of the other rabbits and when sheared gave me a nice 12 ounces of wool this time. No matting to speak of. Good qualities, of course, but the tale will be told if she produces a litter. I put her in with Greenberry's Chocolat after shearing her, and she was NOT happy about it. At nearly two it's time she settled down into motherhood, so we'll see. She'll get the same three chances to produce a healthy litter as the rest of my rabbits. Just to prove that there was a rabbit under all that wool! Misty was grumpy in the evening after her trying day, but this morning she was back to being cheerful and hungry! I also sheared her mother, Angel, who has been tending a nice litter of seven bunnies. Mom was a little grumpy herself when I started shearing, but settled down nicely after I let her rest. Turned out she needed a potty break! In spite of tending the litter, Angel's wool was gorgeous and not matted. She had striped belly, legs and bib of wool for her nest so there wasn't a huge amount but it was all nice. Another nice day then, yesterday, of shearing bunnies, with barn swallows calling outside and the flash of a passing bluebird over the grass. In the afternoon, after a nap because of allergies, I met with one of the merchants about the folk fair. Then, so much fun, I went with Kym down to town for dinner and a movie. Loved Sisterhood of the Traveling Pants! Chick flics don't get much better. I hadn't gotten around to reading the book, but can't imagine it could be better than the movie. Wonderful scenery in Greece and a charming story. Hard to ask for more! Wonderful to see my young friend and hear of her adventures as she travels to wine festivals. Hard work but rewarding, I think, in many ways. And it rained! Of course. There were some fierce storms south of here and the roads were washed with mud and rivulets of water rushed everywhere. Today has been overcast all day with some drizzle. The cool weather is good for the bunnies. Or so I comfort myself! 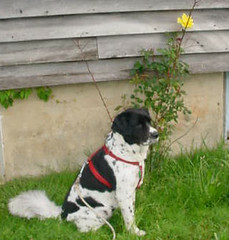 And here's Lily, posing beside the yellow rose and watching for dangerous kitties and other perils. Her fur is growing back a little and she is starting to look more like my little darling!